Microsoft SharePoint is proliferating throughout enterprises in various deployment models (e.g., SaaS) for consistent data delivery and universal access. But distributed SharePoint implementations and distributed end-users could adversely affect the performance of accessing SharePoint over large corporate networks. 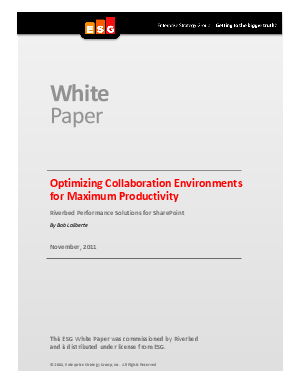 This white paper analyzes the challenges of optimizing a web-based SharePoint environment and discusses how Riverbed IT performance solutions can help. Thanks to a growing portfolio of offerings, Riverbed can help organizations optimize web content, manage traffic, optimize the link, load balance between servers, and provide network monitoring and management solutions to ensure consistent performance or take corrective action when needed. Download this paper to learn how to address all the requirements across the application and technology stack to deliver the best return on investment for SharePoint deployments.